To apply a paste car wax with a dual action polisher, you will need a gray finishing pad, your paste wax of choice, and a pair of microfiber gloves. 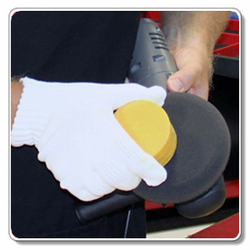 For example, you can use Pinnacle Souver�n Carnauba Wax and the Porter Cable 7424XP Polisher. Place a clean microfiber glove over one hand. When the wax comes out of the jar, the glove will prevent contamination of the wax and also help you grip it so you don't drop it. To get the wax out of the jar, hold the jar upside down and knock it against your hand until it slides out. Using your gloved hand, hold the wax and butter the foam pad with it. Put the wax down on a plastic bag or some uncontaminated surface until you need to reload the pad. 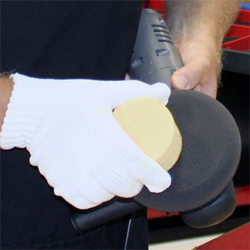 Work the wax out of the container and hold onto it with a clean microfiber glove or nitrile glove. Butter the pad with the wax. Then set the wax onto a plastic bag or other clean surface until you need to reload the pad. Use the Porter Cable at a speed of 3 to spread the wax over the car's paint in an overlapping, side to side motion. You don't need speed to apply wax. Your goal is even, thin coverage. Once you've covered the desired area, perhaps half of the hood, you'll need to remove it. Use a soft microfiber towel or bonnet to buff off the wax. Because paste waxes typically need to be applied and removed one section at a time, you may find it easier to buff with a towel as opposed to putting on a clean pad and bonnet after every section. Always fold your towels 4 ways to give you 8 sides to wipe with and to provide cushion to spread out the pressure of you hand. As a portion of the towel becomes covered in wax, switch to a clean portion to ensure complete removal of the wax residue. If you're using Pinnacle Souver�n, you'll find that it does not leave a chalky haze like some waxes. It does not need to fully dry. It is what we call a "wipe on, wipe off" wax or WOWO wax. Souver�n is very easy to remove. Finally, after you've applied and removed wax from the entire vehicle, you want to go back over it with a final wipe using a clean microfiber towel. This step will help you spot any residual dust (not a problem with Souver�n! ), smears, or places you missed. Don't forget to put your wax back in the jar and seal it to keep it clean for the next time.